Cathy McMorris Rodgers, Donald Trump's pick for Secretary of the Interior, is a Republican. That's most of what you need to know right there. President Elect Donald Trump looks like he's chosen Spokane's own U.S. Rep. Cathy McMorris Rodgers as his Secretary of the Interior. And already, we've seen a lot of dramatic statements casting her as a drill-happy pillager of public lands who spells doom for rivers and forests. Here, we'll try to put Cathy McMorris Rodgers' career in context, focusing on her likely priorities as Secretary of the Interior. 1) She's pretty much a generic Republican. McMorris Rodgers isn't someone like Raul Labrador, prone to publicly challenge the party's conventional wisdom. Instead, with the possible exception of her caution of military intervention in Syria, she's been a party-line Republican, more in the Rep. Eric Cantor mode than the Ted Cruz mode. Mainstream Republicans are skeptical of climate change and in favor of pipelines and drilling; so is McMorris Rodgers. While she has a 0 percent score from the League of Conservative Voters, so do over 100 of her Republican colleagues in the House. We once asked McMorris Rodgers where, if anywhere, she disagreed with the Republican party platform. She responded by reiterating Republican conventional wisdom on Obamacare. Similarly, she's been loath to acknowledge the heavy division within the Republican party. My interview with her in 2013 focused on the big internal debates within the party over immigration and health care. She seemed confident that Eric Cantor's proposal to fund "high-risk pools" for health insurance for those with pre-existing conditions would eventually pass. Not only did it not pass, Cantor spectacularly lost his primary the next year. So, is she an extremist? That depends on if you think the average Republican is an extremist. Compared to many of her Republican colleagues, she clearly isn't. For example, she didn't pass the purity test of Cliven Bundy supporter and state Rep. Matt Shea. Shea refused to endorse her, or anyone else, during this year's primary. 2) She supported selling off federal lands — but just the federal lands already deemed "suitable for disposal" during the Clinton administration. A lot of progressive blogs and critics have been jumping all over a bill that McMorris Rodgers co-sponsored in 2011 that favored selling off several million acres of federal land. But it's important to separate this bill from more radical proposals that suggest, say, giving over federal lands almost entirely to the states. In other words, her support of that one bill doesn't exactly make her Cliven Bundy. 3) She promised to call out Trump for his offensive statements — then stopped doing that. McMorris Rodgers was never really outspoken about her concerns about Trump — at least not the way that former presidential candidate Mitt Romney was. treat everyone respectfully and to build an inclusive coalition. As the election proceeded, however, McMorris Rodgers' skepticism toward Trump seemed to vanish. By September, she said at a news conference that "we are excited at the leadership of Donald Trump and Mike Pence that they're bringing to this country to 'make America great again.'" She criticized Trump for his Access Hollywood remarks in October, saying “It is never appropriate to condone unwanted sexual advances or violence against women," and “Mr. Trump must realize that it has no place in public or private conversations.” But other than that, nothing. A few days after the election, she was spotted passing out Make America Great Again hats to her constituents. 4) McMorris Rodgers really loves dams. 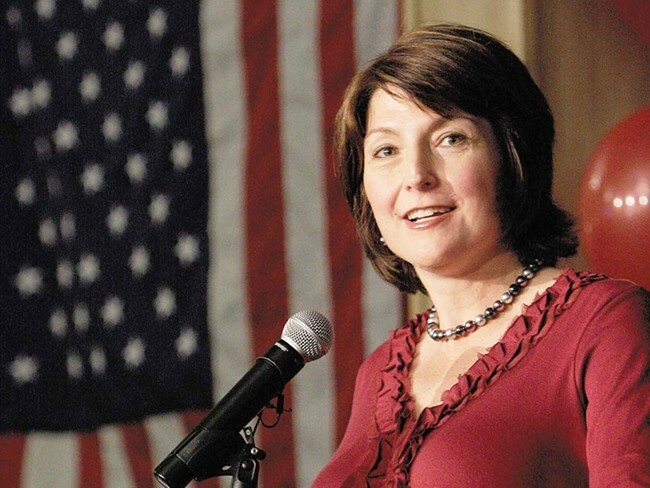 Much of McMorris Rodgers' legislation has been centered on boosting or supporting hydroelectric power. She believes hydropower could be used more prominently throughout the United States. "Unlike other renewables, like wind and solar, hydro is a consistent reliable energy source that produces power regardless of the weather conditions or time of the day," she wrote in a 2011 op-ed. She argues that modern technology allows salmon and dams to coexist without much of a problem. Similarly, she's introduced bills to try to make it easier to relicense hydropower facilities. Sometimes her support for dams has earned her the ire of environmental groups. But she's also received a rare note of praise from the American Rivers advocacy group, noting how, in 2013, she "worked with American Rivers on successful legislation to promote hydropower without undermining bedrock environmental laws like the Clean Water Act." They were less impressed with her recent work, where they say McMorris Rodgers "authored and championed legislation to roll back protections at hydropower dams, weakening safeguards for clean water, fish and wildlife and public lands, and undermining the protection of tribal lands in hydroelectric dam relicensing proceedings. " 5) McMorris Rodgers is not a fan of the Endangered Species Act — or at least how it's been used. In a 2008 press release on Endangered Species Day she argued the act had been a failure in need of reform, saying it had "become a source of conflict between federal regulators and communities and local landowners." "Now is the time to move away from burdensome regulations, lawsuits and punitive settlements to a more balanced and collaborative approach to land use," McMorris Rodgers wrote. It's a theme she's returned to repeatedly, proposing a bill that would inform customers of just how costly conforming with the Endangered Species Act would be. She also praised the decision to delist the gray wolf as an endangered species. 6) She's suggested big forest fires should be addressed through better forest management — not by addressing climate change. McMorris Rodgers isn't the kind of representative who's spent a lot of time railing against the science on climate change. But she's often dodged questions about whether higher temperatures were responsible for more forest fires, instead blaming forest management practices. She's pushed legislation to make removing dead trees from federal lands easier. 7) Her high-profile anecdote in the State of the Union response backfired. Be cautious about automatically believing the anecdotes Cathy McMorris Rodgers offers. In her State of the Union response in 2014, McMorris Rodgers told the story about a "Bette in Spokane," who was paying “nearly $700 per month” in insurance premium increases because of Obamacare. In fact, as the Spokesman-Review found, Bette had bypassed better insurance deals, in part because she refused to use the state's Health Plan Finder website. 8) She fervently opposed the proposed Spokane tribal casino that the Bureau of Indian Affairs approved. Like a lot of public officials in the region, Cathy McMorris Rodgers was opposed to the STEP project, a casino and hotel complex proposed by the Spokane Tribe. Pointing to how the casino's location would put it directly under a training flight path for Fairchild Air Force Base, she argued that the casino is a "tremendous threat to Fairchild and it's future." Initially, the military raised concerns about the proposed casino. But while critics of the project continued to allude to behind-the-scenes military opposition to the project, the public statements made by the military didn't match the rhetoric of the STEP project's foes. Former Assistant Secretary of the Air Force Terry Yonkers testified that the project presented an "insignificant disruption to the Fairchild flying mission." Even more explicitly, the military explained that all their concerns about the project had been dealt with by mitigations taken by the tribe. "Any issues of that may have been of concern were addressed via the Tribe's proposed mitigations," Assistant Secretary of the Air Force Miranda Ballentine wrote. The casino was also opposed by the Kalispel Tribe, who raised concerns about the project's impact on their own casino nearby. Ultimately, both the Bureau of Indian Affairs and Gov. Jay Inslee approved the project, and it's moving forward. So why does Cathy McMorris Rodgers view on this matter? Because the Department of Interior oversees the Bureau of Indian Affairs. 9) Local American Indian tribes have mixed feelings about her. So, overall, how do local tribes feel about McMorris Rodgers? It depends on the tribe. The Colville Tribe praised her for her support of a bill to give local tribes more control over their land. Similarly, she's appreciated by the Kalispel Tribe, who called her "responsive to the needs of our community." But the Spokane Tribe has expressed frustration over McMorris Rodgers. Despite her initial support of a bill to compensate the tribe for the damage that Grand Coulee did to the Spokane Tribe, the tribe suggested that McMorris Rodgers had done little to move the proposal forward since then.